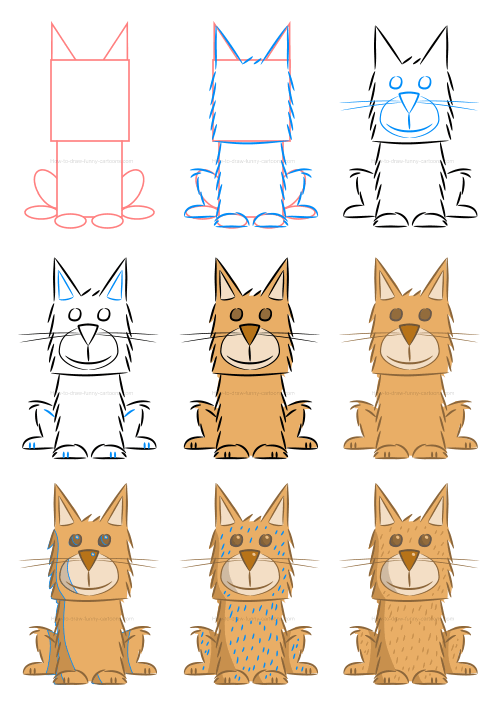 Using nine easy steps, learn how to create a cat illustration that is visually appealing and mostly made from small irregular lines for a look that is authentic and refreshing. Instead of using a vector application to create the perfect image, this illustration was created with small imperfections on purpose to show that beauty doesn't have to be perfect. 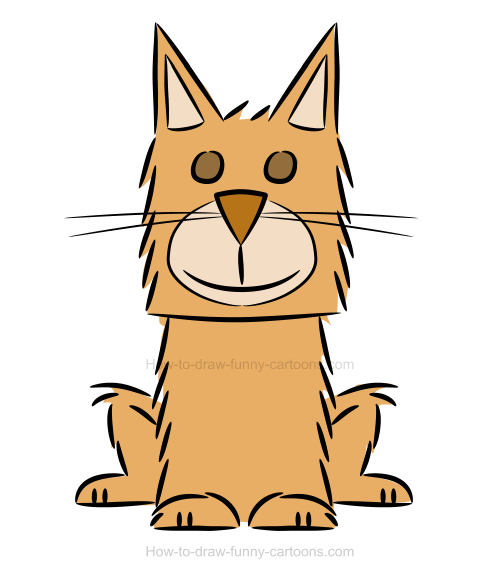 Cats are fun animal to draw mostly because we are quite familiar with these cute animals. 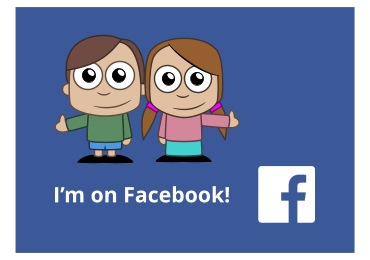 Simply draw a character with pointed ears, a small nose made from a triangle and a few whiskers and you are done! Let's see how we can end up with the cute fellow found below in just nine easy steps. 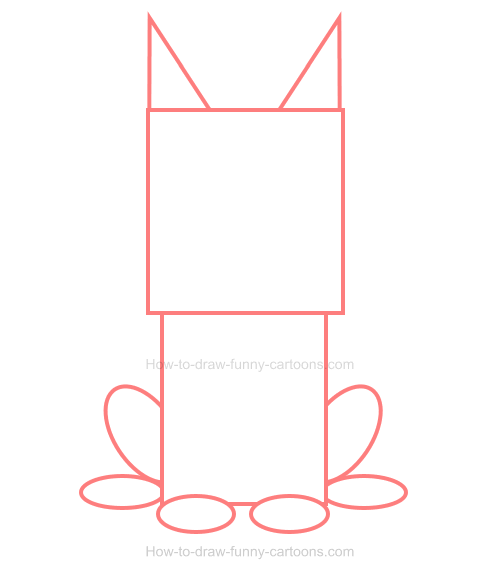 Let's begin by creating a template to help us draw a cute cartoon cat. 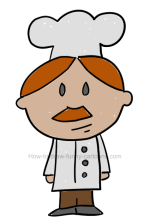 You can start by drawing a square to form the head. The body is made from a smaller square and the ears are represented by two pointed triangles. 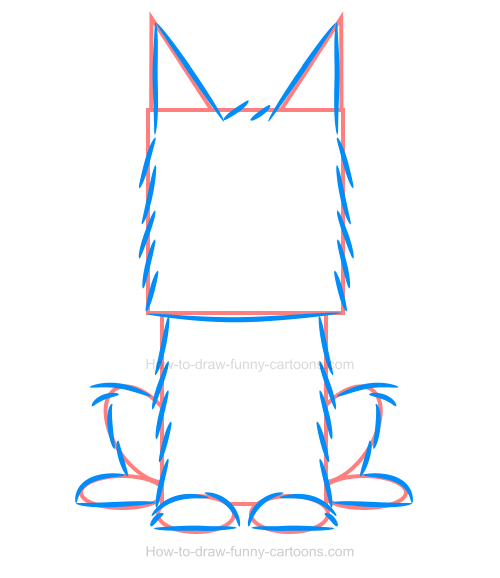 Finally, sketch the front legs and the back ones using small oval shapes. Good! 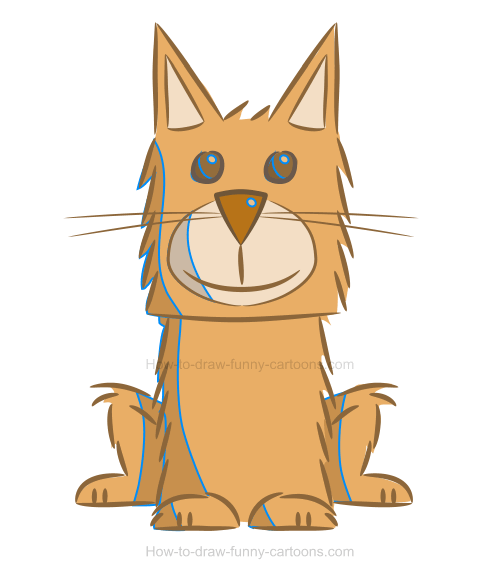 Now that we have a template to work with, let's draw a few lines to create this cat illustration. Simply draw small curved lines on shapes created earlier as shown below. 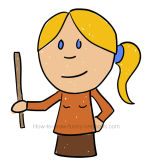 Once you are done, you can erase all basic shapes done in step one (the ones with an orange outline) since they are no longer needed. Inside the head, draw two small circles using small lines to form the eyes. The nose is made from a large irregular triangle while the mouth is illustrated with lines. 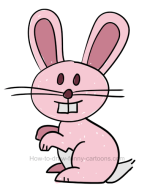 A large patch is drawn around the mouth and a few lines are used to create whiskers. Our cat illustration needs a few more additions before we can add some colors. First, draw patches inside the ears using smaller triangles. Then, draw more lines inside the legs and feet to conclude the drawing aspect of this lesson. 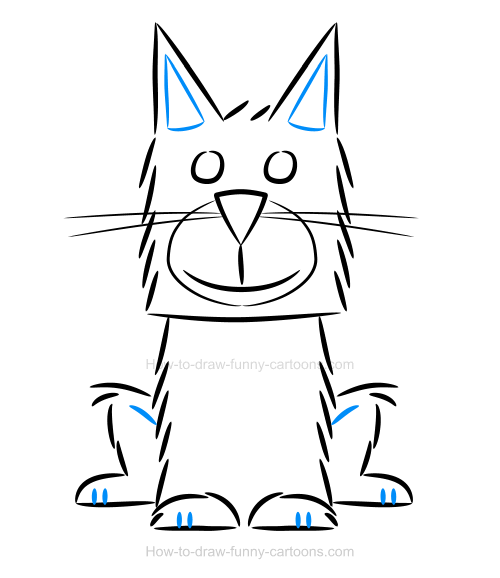 Let's fill in this cartoon cat with great colors. 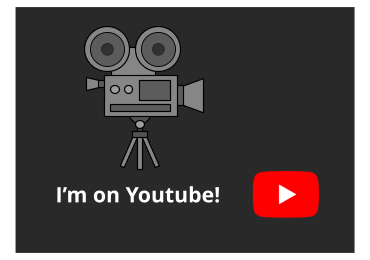 For this template, I have selected a bright orange color. The patches inside the ears and around the mouth can be brighter. The nose and the eyes are darker. Black outlines (or strokes) are fine, but adding colors on these elements can also help the drawing become visually more interesting. 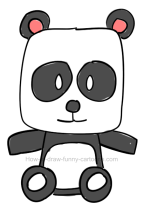 In this case, I simply selected a darker version of the color already found inside the cartoon character. Let's add a few shadows to give a little bit more depth to this cartoon cat. 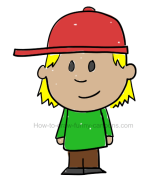 You can draw a large shape on the right side of the head and the body. You can also draw more shapes inside the legs. All these shapes can be filled with a dark brown color. Finally, draw small dots inside the pupils and the nose to complete this step. One last thing that we can do to create more texture using a simple technique is to add small lines all over the head and body. Using a light brown color, these lines are perfect to give a fascinating aspect to this cat illustration without spending hours drawing complex digital effects. Good work! You can now see the final result once all steps are completed. 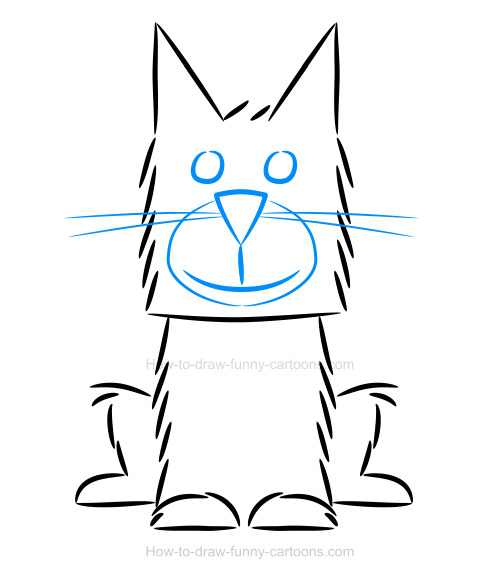 This cute cartoon cat is adorable and can be drawn by anyone willing to spend some time using this lesson carefully. One cute cat illustration created within minutes! These are all steps you need to perform to create a fun animal like the one found in this tutorial. Feel free to create different patterns, use other colors and sketch more textures if you want to experiment using the same template. 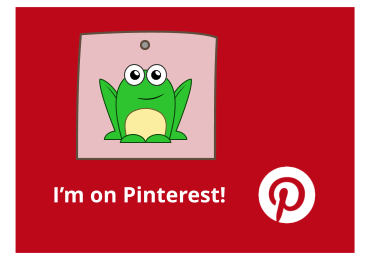 I hope you had fun with this lesson and don't hesitate to try more animals from the same series.